The suburban yard is an outdoor enclosure framed by fences, walls and hedges that define a personal, yet publicly visible, space. In these areas between dwellings, individuals and families express themselves by manipulating and decorating small portions of the landscape. The yard is a meeting point of the natural and artificial — an open air home where earth, plant life and animals are alternately suppressed, cultivated and domesticated. It is a privatized parcel of land that is constructed according the inhabitants’ needs and called upon to serve a variety of roles: an outdoor living room, workspace and playground. This exhibition will bring an urban perspective to what is, typically, a suburban space. The works commissioned for this exhibition are interpretations of the plant, animal, and human life of the lawn — and the accessories that populate it — that are mediated through memory and past experience, through media and the marketing of an American ideal, and through desire and dread. Presented in the context of Socrates Sculpture Park, these installations transpose a suburban vernacular into a metropolitan, industrial environment. 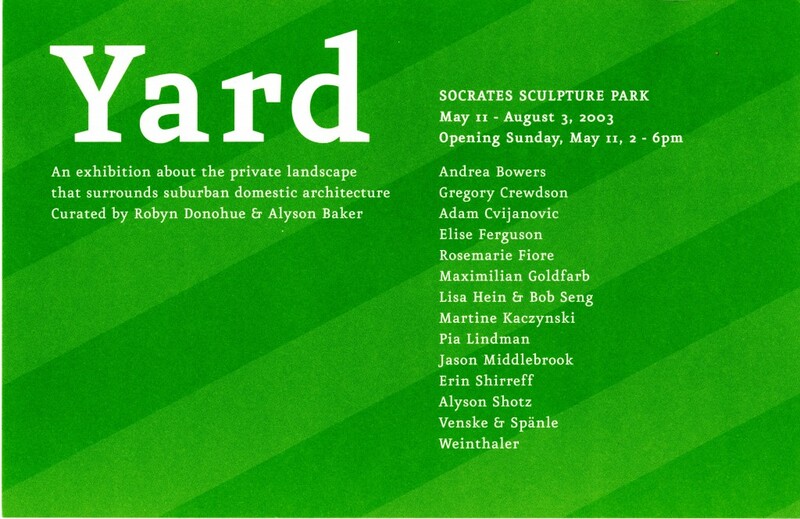 Socrates is a remarkable platform for this exhibition — a former rubble-strewn lot that has made the transition to a natural oasis — it is an entirely built landscape, formed where there was once no land at all. The exhibition recasts the Park as a suburban backyard for an entire urban neighborhood; a displaced American dream of privatized nature. 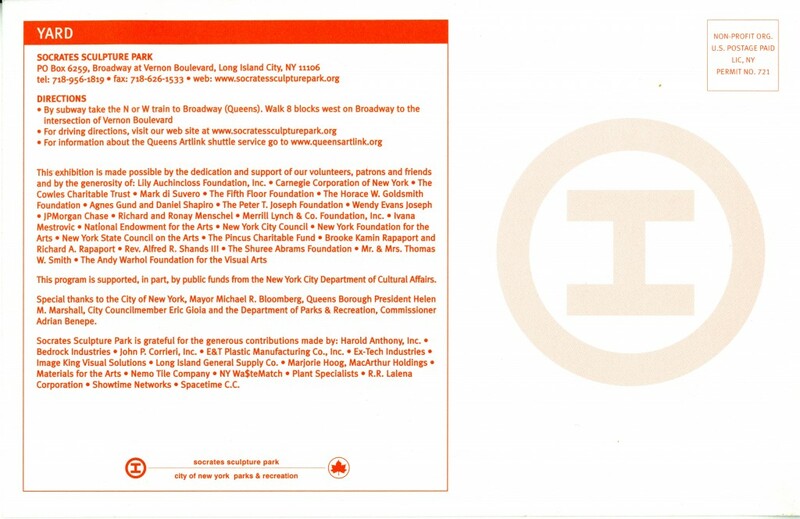 This exhibition is made possible by the dedication and support of our volunteers and friends and by the generosity of: Lily Auchincloss Foundation, Inc., Carnegie Corporation of New York, The Cowles Charitable Trust, Mark di Suvero, The Fifth Floor Foundation, The Horace W. Goldsmith Foundation, Agnes Gund and Daniel Shapiro, The Peter T. Joseph Foundation, Wendy Evans Joseph, JPMorgan Chase, Richard and Ronay Menschel, Merrill Lynch & Co. Foundation Inc., Ivana Mestrovic, National Endowment for the Arts, New York City Council, New York Foundation for the Arts, New York State Council on the Arts, The Pincus Charitable Fund, Brooke Kamin Rapaport and Richard A. Rapaport, Rev. Alfred R. Shands III, The Shuree Abrams Foundation, Mr. & Mrs. Thomas W. Smith, The Andy Warhol Foundation for the Visual Arts. Special thanks to the City of New York, Mayor Michael R. Bloomberg, Queens Borough President Helen M. Marshall, City Councilmember Eric Gioia, and the Department of Parks & Recreation, Commissioner Adrian Benepe. Socrates Sculpture Park is grateful for the generosity of: Harold H. Anthony, Inc., Bedrock Industries, John P. Corrieri, Inc., E&T Plastic Manufacturing Co., Inc., Ex-Tech Industries, Image King Visual Solutions, Long Island General Supply Co., Marjorie Hoog, MacArthur Holdings, Materials for the Arts, Nemo Tile Company, New York Wa$teMatch, Plant Specialists, R.R. Lalena Corporation, Showtime Networks, Spacetime C.C.